﻿ Hebrews 4:9 So there remains a Sabbath rest for the people of God. 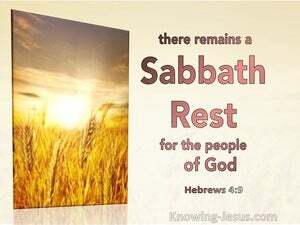 A Sabbath rest remains, therefore, for God's people. There remains therefore a Sabbath for the people of God. [So] then, a Sabbath "rest day" [still] remains for God's people [i.e., for Christians, in heaven]. 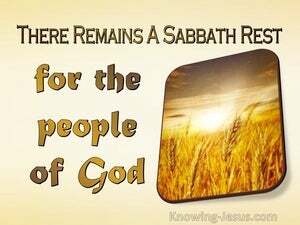 There remains, therefore, a sabbath state for the people of God. So that there is still a Sabbath-keeping for the people of God. which shows that the people of God have a sabbath still to come. Therefore there is a sabbatism left for the people of God. So there must still be a promised Sabbath of Rest for God's people. Therefore a celebration of a sabbath remains to the people of God. Consequently a sabbath rest remains for the people of God. So then there remains a rest to the people of God. There remaineth therefore yet a rest to the people of God. There remaineth therefore a sabbathrest to the people of God. Therefore a sabbatism remains for the people of God. Hence there is, left over, a Sabbath-keeping, for the people of God. A sabbatical rest then still remaineth for the people of God. There is, then, a Sabbath-Rest still awaiting God's People. It follows that there still remains a sabbath rest for the people of God. So a sabbath of rest is still awaiting God's people. Consequently, there remains a sabbath-keeping for the people of God.